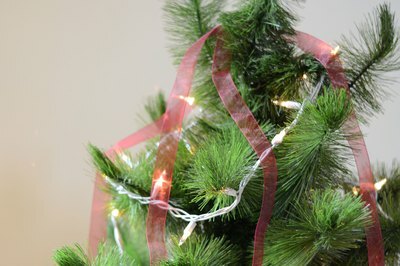 Decorating a Christmas tree with ribbon saves you the mess of using tinsel, and ribbon provides a wide variety of options for colors, sheen, patterns and fabrics. Select a style and color of ribbon that coordinates with the rest of your Christmas tree decorations, and buy enough ribbon to decorate the entire tree; it may take more ribbon than garland due to decorating styles, so plan accordingly. Create an elegant Christmas tree decorating scheme by using wide sheer ribbon in horizontal draping around the tree. 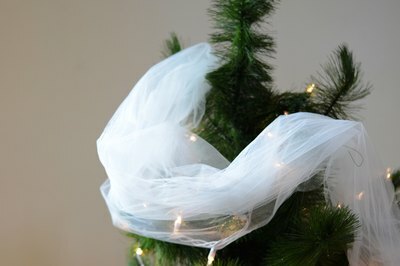 Adding ribbon that is wide (2 to 3 feet) in a material such as raffia, tulle or organza will fill in gaps between the tree branches and allow the lights to sparkle through the fabric. Achieve this look by starting the ribbon at the top of the tree and winding it around, weaving it into the branches to fill any gaps. 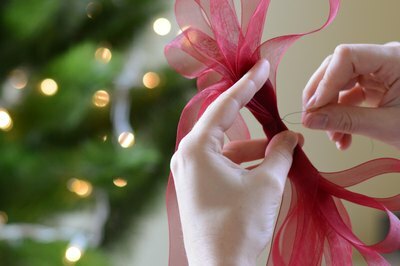 Drape the ribbon in a scalloped shape, spacing the ribbon evenly from the top of the tree to the bottom branches. Hang ribbons vertically on your tree from top to bottom for another ribbon decorating technique. Use the same type of ribbon for all of the vertical strands, or use a variety of different colors or ribbon types for a more eclectic or whimsical result. To hang the ribbons vertically, start unrolling ribbon from a large spool at the top of the tree until it reaches the bottom branches of the tree; cut the ribbon. 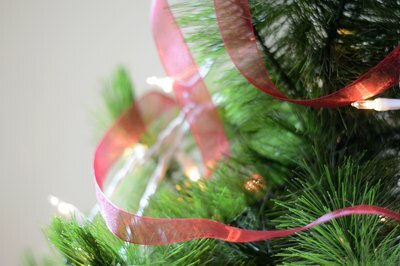 Use the first length of cut ribbon as a guide for cutting the rest of the ribbons until you have the desired amount for your tree. Create a unique Christmas tree garland from a variety of colorful fabric ribbons formed into a chain. Just like the paper chains children make, this chain is made from small pieces of different ribbons. To make a ribbon chain, settle on the desired number of ribbon types, colors and patterns you want to include. Cut the ribbons into six-inch pieces. Start with one piece; wrap it into a loop and secure the ends with double-sided tape. String the next piece of ribbon through the first loop and secure it. Repeat until the garland is long enough to wrap around your tree. Drape the ribbon chain around the tree from bottom to top, creating scalloped drapes along the way. Create a unique tree topper as well as ribbon decorations for the length of the tree by making a large ribbon bow with long tails. To make a ribbon bow, start with a 25-foot spool of ribbon, unraveled. Leaving about five feet for one side’s tail, make a loop in the ribbon, and hold it with your thumb. Loop the ribbon again, holding it to one side of the original loop, keeping both loops secure with your thumb; make another loop and hold it to the other side of the original loop. Continue adding loops to each side until five feet of ribbon remains for the other side’s tail. Wrap a wire around the center of the loops of ribbon to secure. Place the ribbon atop the tree, letting the tails cascade down. "Southern Living": Lights, Ribbon, Action!